The 'LEED 2009 IEQc8.1 Floor Schedule’ is now available with summary results for both times including only the Rooms on each level that are 'Include in Daylighting’. Overall summary results are shown in an information window after 'Generate Results’ is selected and results are calculated. This window shows the combined results for both times for the whole building for all Rooms that are 'Include in Daylighting’. The analysis now supports customization of all settings in the 'LEED 2009 IEQc8.1 Daylighting’ 3d view Properties except the Rendering Settings and the Section Box settings. This means that you can choose Phase Filters and Design Options before selecting Run Analysis and they will be respected by the model exporter. Note that the default 'LEED 2009 IEQc8.1 Daylighting’ 3d view that is created selecting Run Analysis for the first time includes the 'Show All’ phase filter. This will probably have to be reset for models with objects in multiple phases. The Rendering Settings (lighting, sky and time settings) and the Section Box settings will be reset each time Run Analysis is clicked. You can now open and run analysis jobs on more than one project at a time. Results will be downloaded to the correct project and you will be notified which project analysis is done after complete. The legend has been improved to better show the range of results of interest. The values of the points shown in AVF is capped at 6000 lux. You can now turn on and off individual AVF photometric surfaces by level, so you can explore each level in detail in a 3d view, create overhead views for each level, etc. Use the controls in the 3d view properties > Analysis Display Settings to control visibility. Results are available in the AVF Photometric plan in either Lux or FootCandles. Use 3d view properties > Analysis Display Settings to control Scale/Units. Note that this does not change the units used in the AVF scale settings or thresholds, only the AVF legend. A bug was corrected that caused timezone setting associated with the project Location to be ignored. Solar position and climate data values have now been validated against our test models. Error messaging has been much improved. Most common failures are now reported explicitly. This update fixes a failure reporting error where the wrong message was displayed if Green Building Studio was down. There's more information available on Scott Sheppard's It's Alive in the Lab blog. 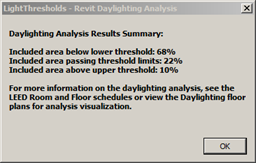 The Daylighting Analysis for Revit technology preview can be joined here.